Use 81D Gastec dosimeter tubes to measure the concentration of Acetic Acid gas in the workplace and other enclosed air spaces. No pump required! Just snap off the pre-scored end and position the dositube in a specific location or clip it to a shirt collar or pocket using the optional Dositube Holder. The length-of-stain color change, forming over the next several hours, can be read directly off the scale printed on the side of the tube--as easy as reading a ther mometer. Divide the reading by the hours of exposure to get a time-weighted average (TWA) concentration of Acetic Acid gas in parts-per-million (ppm). 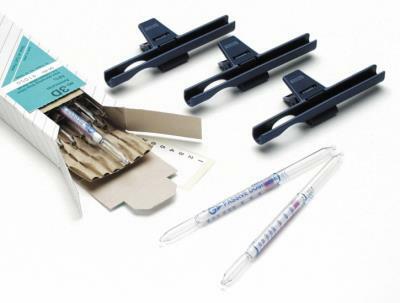 Dosimeter tubes require no pumps, paper charts, secondary operations, or lab analyses--save time and money!